United Nations Security Council (UNSC) has issued a statement expressing full support for the Special Representative of the Secretary-General, Ghassan Salamé, and the United Nations Support Mission for Libya (UNSMIL) as they seek to mediate a political way forward in Libya that would lead to credible and peaceful elections. “The Members called upon all United Nations Member States and regional organizations to unite in support of the Special Representative of the Secretary-General during this critical phase of Libya’s transition.” The statement reads. The Security Council also welcomed the announcement by Salame on 20 March 2019 that the Libyan National Conference will take place from 14 to 16 April 2019 in Ghadames, Libya. “The members of the Security Council also welcomed the convening of United Nations-facilitated talks in Abu Dhabi on 27 February 2019 between the Prime Minister and the President of the Presidency Council of the Government of National Accord, Fayez al-Sarraj, and Libya National Army Commander [Khalifa] Haftar, including their agreement on the need to end the transitional stages in Libya through the holding of general elections.” The statement says, describing Haftar as commander of the Libyan National Army. 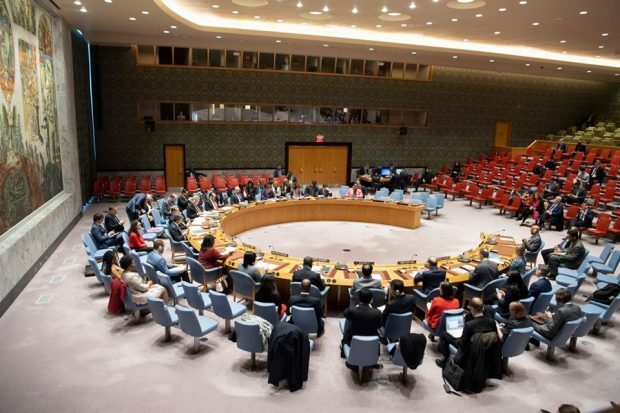 The Security Council said it also recalls Libyan leaders’ commitments, made at the international conferences in Paris on 29 May 2018 and Palermo on 12‑13 November 2018, including to work constructively with the United Nations‑facilitated efforts. The statement also underlined that the National Conference provides a crucial opportunity for all Libyans to put aside their differences, exercise restraint for the good of the country, and achieve peace and prosperity for the Libyan people. “The members called upon all those attending to come together to engage in good faith in this Libyan-led, Libyan-owned process.” The UNSC further added.